"Just about" is an interesting phrase. In British English "he just about succeeded" means he succeeded, but barely. In American English it means he almost succeeded, but didn't - virtually opposite definitions. So by British standards I just about beat the rain, ending my day's hike as sprinkles turned to a steady rain, forecast to last through the night. And by American standards I just about reached the 2500 mile mark today -- will surpass it tomorrow. 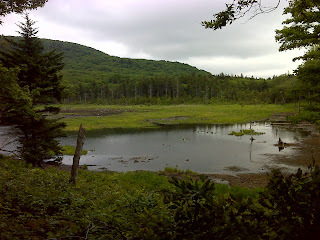 Mostly easy trail today, crossing the MA-VT border and bidding a fond farewell to MA. I'll just about miss it. The Long Trail looms ahead for the next hundred miles. Today it took me past the tiny Seth Warner Shelter, over an unnamed 3100' peak with a 'just about' view, down across Roaring Branch, which was just plain not roaring at all, and finally to the top of Consultation Mountain where, lacking anybody but the trees to consult with, I turned around and headed back. 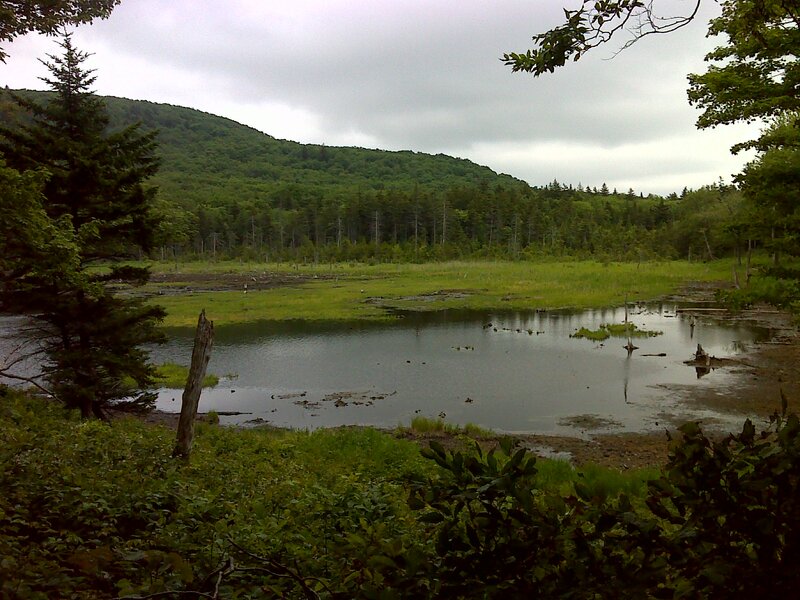 Roaring Branch valley may have lacked its roar, but it had a nice Beaver Pond where the frogs were holding sway. The Beavers, however, seem to have just about given up, as water levels had dropped 3 feet from the rim of their dam. This is the only photo just about worthy of highlighting today.